Ajzen, I., & Fishbein, M. (1980), Understanding Attitudes and Predicting Social Behavior. Prentice-Hall, Englewood Cliffs, NJ. Ali, F., Amin, M., & Cobanoglu C. (2006). An Integrated Model of Service Experience, Emotions, Satisfaction, and Price Acceptance: An Empirical Analysis in the Chinese Hospitality Industry. Journal of Hospitality Marketing & Management, 25(4), 449-475. Altan, S. (2017). 2016’da Online Alışveriş Harcamaları, %24,6 Artış Göstererek 69 Milyar TL’ye Ulaştı. Download Date:14 November 2017. URL: http://www.pazarlamasyon.com/e-ticaret/2016da-online-alisveris-harcamalari-6-artisgostererek-69-milyar-tlye-ulasti/. Anderson. J., & Gerbing, D. (1988). Structural Equation Modeling in Practice: A Review and Recommended Two-Step Approach. Psychological Bulletin, 103(3), 411-423. Bagozzi, R. P., & Yi, Y. (1988). On The Evaluation of Structural Equation Models. Journal of the. Academy of Marketing Science, 16(1), 74-94. Bruner II, G. C., & Kumar, A. (2005). Applying T.A.M. to Consumer Usage of Handheld Internet Devices. Journal of Business Research, 58, 553-558. Burton-Jones, A., & Hubona, G. S. (2005). Individual Differences and Usage Behavior: Revisiting a Technology Acceptance Model Assumption. ACM SIGMIS Database Archive, 36(2), 58-77. Chau, P. Y. K., Hu, P. J. H., Lee, B. L. P., & Au, A. K. K. (2006). Examining Customers’ Trust in Onlinevendors and Dropouts: An Empirical Study. Electronic Commerce Research and Applications, 6(2), 172-83. Chen, L. D., Gillenson, M. L., & Sherrell, D. L. (2002). Enticing Online Consumers: An Extended Technology Acceptance Perspective. Information & Management, 39(8), 705- 709. Chen, L. D., Gillenson, M. L., & Sherrell, D. L. (2004). Consumer Acceptance of Virtual Stores: A Theoretical Model and Critical Success Factors for Virtual Stores. Database for Advances in Information Systems, 35(2), 8-31. Childers, T. L., Carr, C. L., Peck, J., & Carson, S. (2001). Hedonic and Utilitarian Motivations for Online Retail Shopping Behaviour. Journal of Retailing, 77(4), 511-535. Chin, W. W. (2010). How to write up and report PLS analyses V.E. Vinzi, W.W. Chin, J. Henseler, H. Wang (Eds. ), Handbook of Partial Least Squares: Concepts, Methods and Applications in Marketing and Related Fields, Springer. Chin, W. W., Peterson, R. A., & Brown, S. P. (2008). Structural Equation Modeling in Marketing: Some Practical Reminders. Journal of Marketing Theory and Practice, 16(4), 287‐298. Chircu, A. M. Davis, G. B., & Kauffman R. J. (2000). Trust, Expertise and Ecommerce Intermediary Adoption J. DeGross (Ed. ), Proceedings of the sixth Americas conference on information systems, ACM, New York. Davis, F. D. (1989). Perceived Usefulness, Perceived Ease of Use, and User Acceptance of Information Technology. MIS Quarterly, 13, 319-39. Davis, F. D., Bagozzi, R. P., & Warshaw, P. R. (1992). Extrinsic and Intrinsic Motivation to Use Computers in the Workplace. Journal of Applied Social Psychology, 22, 1111–1132. Diamantopoulos, A., & Siguaw, J. A. (2006). Formative versus Reflective Indicators in Organizational Measure Development: A Comparison and Empirical Illustration. British Journal of Management, 17(4), 263‐282. e-marketer. (2017). Mobile drives growth of online travel bookings. Download Date:15 November 2017. URL: https://www.emarketer.com/Article/Mobile-Drives-Growth-ofOnline-Travel-Bookings/1016053. Ha, S., & Stoel, L. (2009). Consumer E-Shopping Acceptance: Antecedents in a Technology Acceptance Model. Journal of Business Research, 62, 565–571. Hair, J. F., Hult, G. T. M., Ringle, C. M., Sarstedt, M., & Thiele, K. O. (2017). Mirror, Mirror on the Wall: A Comparative Evaluation of Composite-Based Structural Equation Modeling Methods. Journal of the Academy of Marketing Science, 45(5): 616-632. Hair, J. F., Hult, G. T. M., Ringle, C. M. & Sarstedt, M. A. (2013). Primer on Partial Least Squares Structural Equation Modeling. Sage, Thousand Oaks. Hair, J. F., Sarstedt, M., Ringle, C. M., & Mena, J. A. (2012). An Assessment of the Use of Partial Least Squares Structural Equation Modeling in Marketing Research. Journal of the Academy of Marketing Science, 40(3): 414-433. Hair, J.F. Ringle, C.M. & Sarstedt M. A. (2011). PLS-SEM: indeed a silver bullet. Journal of Marketing Theory and Practice, 19(2), 139-151. Hair, J. F., Black, W C., Babin, B. J., & Anderson, R. E. (2010). Multivariate Data Analysis. 7th Edition, Pearson, New York. Ham S., Kim W. G., & Forsythe H. W. (2008). Restaurant Employees’ Technology Use Intention: Validating Technology Acceptance Model with External Factors. Journal of Hospitality & Leisure Marketing, 17(1/2), 78–98. Henseler, J., & Sarstedt, M. (2013). Goodness-Of-Fit Indices for Partial Least Squares Path Modeling. Computational Statistics, 28(2), 565-580. Karataş, M., & Babür, S. (2013). Gelişen Dünya’da Turizm Sektörünün Yeri. KMÜ Sosyal ve Ekonomi̇k Araştırmalar Dergi̇si, 15(25), 15-24. Kim, D. J., Ferrin, D. L., & Rao, H. R. (2008). A Trust-Based Consumer Decision-Making Model in Electronic Commerce: The Role of Trust, Perceived Risk, and Their Antecedents. Decission Support System, 44(2), 544-564. Kubaş, A., Yılmaz, R., Güt, A., & Baloğlu, S. (2016). Tekirdağ İlinde bulunan Tüketicilerin İnternet Üzerinden Satın Alma Yaklaşımlarının analizi. Social Sciences Research Journal, 5(4), 12-29. Lim, W. M., & Ting, D. H. (2012). E-Shopping: An Analysis of the Technology Acceptance Model. Modern Applied Science, 6(4), 49-62. Lu, Y., Zhou, T., & Wang, B. (2009). Exploring Chinese Users’ Acceptance of Instant Messaging Using the Theory of Planned Behavior, the Technology Acceptance Model, and the Flow Theory. Computers in Human Behavior, 25, 29-39. Moon, J. W., & Kim, Y. G. (2001). Extending the TAM for A World Wide Web Context. Information & Management, 38, 217-30. Peng, D. X., & Lai, F. (2012). Using Partial Least Squares in Operations Management Research: A Practical Guideline and Summary of Past Research. Journal of Operations Management, 30(6), 467-480. Podsakoff, P. M., MacKenzie, S. B., Podsakoff, N. P., & Lee J. Y. (2003). The Mismeasure of Man(agement) and Its Implications for Leadership Research. The Leadership Quarterly, 14(6), 615-656. Reinartz, W. J., Haenlein, M., & Henseler, J. (2009). An Empirical Comparison of the Efficacy of Covariance-Based and Variance-Based SEM. International Journal of Market Research, 26(4), 332-344. Rousseau, D. M., Sitkin, S. B., Burt, R. S., & Camerer, C. (1998). Not So Different After All: A Cross-Discipline View of Trust. Academy of Management Review, 23, 393-404. Selamat, Z., Jaffar, N., & Ong, B. H. (2009). Technology Acceptance in Malaysian Banking Industry. European Journal of Economics, Finance and Administrative Sciences, 1(17), 143-155. Shih, H. P. (2004). An Empirical Study on Predicting User Acceptance of E-Shopping on the Web. Information & Management, 41(3), 351-368. Simkin, M. G., & McLeod, A. (2010). Why Do College Students Cheat? Journal of Business Ethics, 94, 441-445. Taylor, S., & Todd, P. A. (1995). Understanding Information Technology Usage a Test of Competing Models. Information Systems Research, 6, 144-176. Tenenhaus, M., Esposito Vinzi, V., Chatelin, Y. M., & Lauro, C. (2005). PLS Path Modeling. Computational Statistics & Data Analysis, 48(1), 159-205. Teo, T. S. H. (2001). Demographic and Motivation Variables Associated With Internet Usage Activities. Internet Research, 11(2), 125-137. Türker, A., & Türker, G. Ö. (2013). Turistik Ürün Satın Alma Davranışının Teknoloji Kabul Modeli İle İncelenmesi. Dokuz Eylül Üniversitesi Sosyal Bilimler Enstitüsü Dergisi, 15(2), 281-312. Venkatesh, M., Morris, G., & Davis, F. D. (2003). User Acceptance of Information Technology: Toward A Unified View. MIS Quarterly, 27(3), 425-78. Wetzels, M., Odekerken-Schröder, G., & van Oppen, C. (2009). Using PLS Path Modeling For Assessing Hierarchical Construct Models: Guidelines and Empirical Illustration. MIS Quarterly, 33(1): 177-195. Yuslihasri, I. A., & Daud, A. K. (2011). Factors That Influence Customers Buying Intention On Shopping Online. International Journal of Marketing Studies, 3(1), 128-143. ISNAD SEVİM, Nurdan , YÜNCÜ, Deniz , EROĞLU HALL, Elif . "Analysis of the Extended Technology Acceptance Model in Online Travel Products". 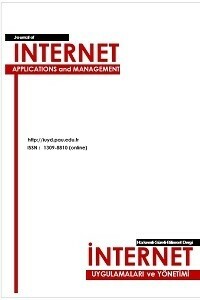 Journal of Internet Applications and Management 8 / 2 (December 2017): 45-61.